The rich history of people of African heritage in the Santa Clara Valley began as early as 1777, and in the 1800s, a lively black community took root. 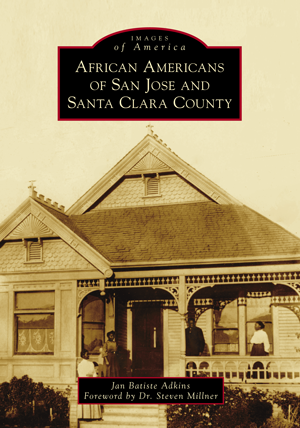 By the Great Migration in the 1900s, neighborhoods in San Jose, Palo Alto, and Santa Clara became home to many African Americans from Southern and Midwest states who were seeking new opportunities. By the 1960s, African Americans found jobs in the emerging technology industry, at Ford Motor Company, and in public service agencies. African Americans pursued degrees at San Jose State College (SJSC), the University of Santa Clara, Stanford University, and community colleges located in the Santa Clara Valley. SJSC's athletic programs opened the door for student athletes, while Dr. Harry Edwards, John Carlos, and Tommy Smith took on civil rights challenges. The complicated history of the black community throughout Santa Clara County has mirrored the nation's slow progress towards social and economic success. This progress is captured in the presented images chronicling individual stories of political struggle, success, and triumph. Jan Batiste Adkins, an educator, lecturer, and author of African Americans of San Francisco and African Americans of Monterey County, has spent the last 10 years researching the lives and stories of African Americans living in communities of Northern California. Dr. Steven Millner is a professor of African American studies at San Jose State University.